Christians, friends, family members and a college of priests recently joined Rev. Frs. John Tchamnda, Sebastian Fonsah and Jude Thaddeus Mbi to fête their 25-year-sojourn in priesthood. The setting was the Holy Family Parish, Limbe. Bishop Immanuel Banlanjo Bushu of Buea Diocese, in his homily at the occasion, enjoined Christians to thank God for the lives of the priests and the work they have done. While urging Christians to pray for the priests’ holiness, he also exhorted Christians to be holy. Other members of the diocese congratulated the priests for their perseverance and zealous contributions in their pastoral work and other social spheres to the growth of God’s church in Buea Diocese. However, they were cautioned against amassing wealth, but to serve God’s people without discrimination. In his 25 years of priesthood, Fr. Tchamnda has served in eight parishes in Buea Diocese. To him, 25 years in priesthood is a medley of joy and sorrow. To Fr. Fonsah, "priesthood to me is a gift and a mystery and I thank God for it. It is thanks to the Christians, for they have helped me to grow in the ministry," he said. On his part, Fr. Mbi said: "It has been a wonderful period in my ministry. I am extremely grateful to God for the many blessings received". Frs. 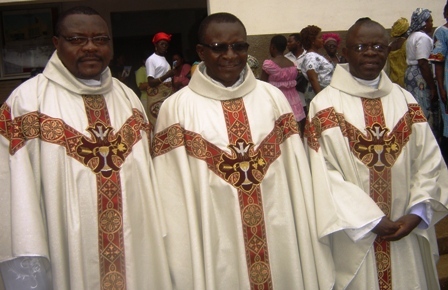 John Tchamnda, Sebastian Fonsah and Jude Thaddeus Mbi were ordained on April 6, 1986, at the Regina Pacis Cathedral in Small Soppo, Buea, by Bishop Emeritus of Buea Diocese, Mgr. Pius Suh Awa. Despite his fragile health, Mgr. Awa was present at the silver jubilee mass to celebrate and pray with his priests.